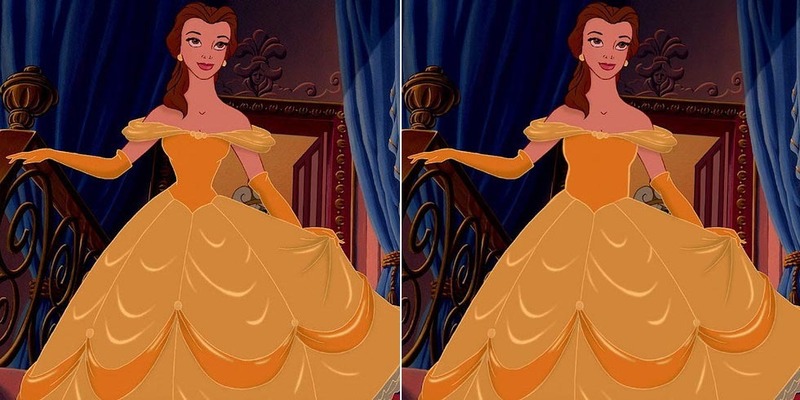 Buzzfeed’s Loryn Brantz decided to digitally edit six famous Disney ladies — Ariel (“The Little Mermaid”), Pocahontas (“Pocahontas”), Jasmine (“Aladdin”), Belle (“Beauty and the Beast”), Aurora (“Sleeping Beauty”) and Elsa (“Frozen”) — to show what the cartoon heroines would look like if they had more realistic physical proportions. After all, since these characters are supposed to represent people in films made for children, they should probably look more like real people, right? Calling to mind the argument for a more anatomically correct Barbie doll, others have also highlighted the impractical proportions of Disney’s princesses by comparing them to real-world bodies. Last year, artist Meridith Viguet got some press for a tutorial she created on how to draw a Disney-friendly version of a princess. Disney’s animated female figures, she noted, typically have long, slender necks; “demure” shoulders; B- or C-cup breasts and “soft but very defined” waists. But don’t look for hips, because Disney princesses tend not to have them, Viguet pointed out in her tutorial, using Meg from “Hercules” as an example. “[H]er curves DON’T come from having really round hips, but from connecting the top of her legs (which are at their widest) to a slim waist,” Viguet writes of Meg.